Cutler Brothers Productions in Deer Lodge will produce Harper Lee’s classic drama “To Kill a Mockingbird” at their theatre this June. “To Kill a Mockingbird” is the second show of the Cutler Brother’s 2015 summer theatre season. The theatre family decided to produce the intense drama after “Of Mice and Men” proved to be a crowd favorite in 2014. 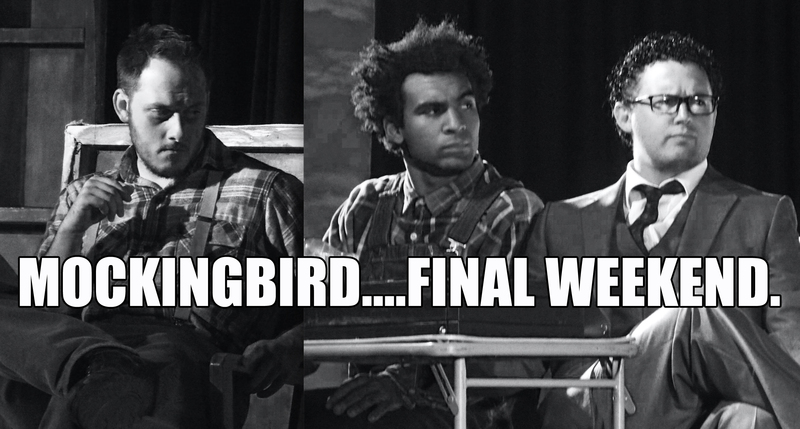 For all To Kill A Mockingbird photos click here. “To Kill a Mockingbird” takes place in 1935 in Maycomb, Alabama. It is the dramatic story of Atticus Finch (Kelly Cutler), a southern defense attorney, and his two children Scout (Taylor Stevenson) and Jem (Ben Logan). Atticus is faced with the challenge of defending Tom Robinson (Marquis Archuleta) who is a black man being accused of attacking Mayella Ewell (Sarah Tilley), a white woman. Atticus not only goes to head with Mayella’s father Bob Ewell (Cody Root) but he lacks support from the entire county of Maycomb. Needless to say Mr. Finch loses the case to Maycomb’s prosecutor Mr. Gilmer (Jim Cameron) and the story continues to unravel in the most mysterious and heart wrenching ways. Other cast members include Scott Grazier as the Judge, Alex Becker as Dill, Candice O’Brien as Miss Stephanie, and Rex Kendall as the infamous Boo Radley, the character most commonly attributed to the likes of Robert Duvall. Butte’s very own Cheri Taylor will play Mrs. Dubose and Anaconda’s Gwen Walker will make an appearance as the Reverend. Gwen was last seen on the Cutler stage in “Of Thee I Sing” back in 2008. Cutler Brother’s theatre intern Heather Bach will play Calpurnia and Carrissa Lund will play the motherly Miss Maudie. “To Kill a Mockingbird” will run at the Cutler Theatre from June 12th – June 28th, Fridays and Saturdays at 7:30 pm and Sunday matinees at 2:00 pm. Tickets are $15 general admission and may be pre-reserved at Cutler Bros. Box Office (406) 846-4096. For more information visit cutlerbros.com.